HowToRepairGuide.com: Hummer H2: How to remove Front Door panel? How to remove front door interior panel on 2003 Hummer H2. The tool is required to remove door panel.So don't forget to get that tool,before you start this task. Its a easy to do job.You can do it yourself. There is only one retaining screw and everything else is basically clips,the tool helps to dis-engage the clips without breaking them. The one screw under the handle bezel, and the rest are clips. After the clips are removed from door the top of the panel is pushed toward the outside and upwards to release it from the window channel. Remove the door handle bezel. Remove the door panel retaining screw located in the handle bezel opening. Remove the door window switch. 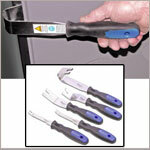 Use special tool J 38778 to release the door trim panel retaining clips. Disconnect the electrical wiring harness connectors. Remove the door trim panel from the vehicle. Remove the bezel from around the door handle, Remove the bezel from the vehicle. How to remove the door panel to install a new window regulator? window motor, regulator and door panel removal? How to Remove Door Panels ?